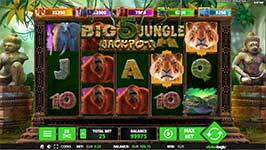 Find the courage to come face to face with some of the most powerful animals on the planet in Big 5 Jungle Jackpot slot machine by Stakelogic! This exciting new release has 5-reels and 25-lines while offering some rewarding bonus features and wins of up to 312,500 per spin! This gorgeous new game brings you into the heart of the jungle where tigers, orangutans, crocodiles, elephants and others reside. Each of these animals offers a different jackpot prize which is really the heart of this slot. Other features in the game are wilds, free spins and the lock and spin feature which together give you a 95.21% RTP. Tiger’s Eye Wilds – The Tiger’s Eye symbol is the game’s wild and will substitute for all symbols except the Bonus Symbols to complete wins. You can find the symbols on reels 2, 3 and 4. Jackpot Prize – When the reels are completely filled with matching animal character symbols and/or wild symbols, the Jackpot Prize for that animal is awarded. The value of each Jackpot prize for the different animals is displayed at the top of the reels. Free Spins Bonus – Landing four or more bonus symbols anywhere on the reels will award you the free spins bonus. You can win anywhere from 10 to 30 free spins! Lock and Spin Bonus Feature – While Free Spins are being played, when any animal character landing on the first reel and fills all three positions on that reel, the Lock and Spin feature is activated. When this feature is triggered, all of the animal symbols that match that character on reel 1 and any wild symbols on reels 2 through 5 are locked in place. The reels will continue to spin and lock those symbols until all of the positions on the reels are locked or when no new symbols are locked on a re-spin.